On the menu this week are some favorite down-home comfort foods, lightened up with more veggies and less meat. On the menu this week are some favorite down-home comfort foods. 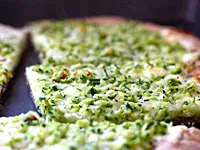 Grab a few zucchini from your local farmer's market and see how amazing they taste as a pizza topping! Whip up a delicious batch of zucchini bread with any extras. Also, take a break from meat with my meatless sloppy joe recipe. This has been a hit on my blog EatLiveRun for years, and I promise it will be a favorite in your house too! 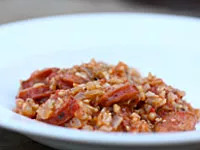 A true Cajun delight, this jambalaya is definitely a crowd-pleaser without breaking the bank. Leftovers are even better the next day! Heat oil in a Dutch oven over medium-high heat. Brown sausage, and then remove and set aside. Add the flour to the oil and make a dark roux by cooking the flour over medium-high heat until golden in color, stirring continuously with a rubber spatula. Add the chopped onions, celery, and parsley to the roux, and toss well to coat. Cook for about 6 minutes or until the onions are soft. Put in the garlic and cook for 30 seconds more. Add the water, tomatoes, rice, salt, pepper, and cayenne. Stir well and bring to a boil. Reduce heat to low, then cover and simmer for about 1 hour—no peaking! Before serving, fluff jambalaya with a fork and add more hot sauce to taste. Experiment with the meat-free crumbles found in your supermarket's produce section for this heart-healthy sloppy joe recipe. I promise you won't be able to taste the difference! Sauté together the onion and garlic in a nonstick cooking pan for a couple of minutes, or until the onion is soft. Add the ground soy, tomato sauce, BBQ sauce, water, and spices, and stir to combine. Bring to a boil, then reduce to a simmer for a few minutes. Serve atop a salad or traditional sloppy joe style in a whole-wheat sandwich bun! Leftovers of this pizza will be delicious for a fast breakfast on the go! It's not greasy or heavy like some pizzas can be, and you may even be able to convince your kids that green is good! Preheat the oven to 500º. Either dust cornmeal on a baking sheet (a pizza stone is even better) or spray with nonstick spray. Set aside. Grate the zucchinis and press with paper towels to soak up the liquid. Mix the zucchini with the mozzarella cheese and a dash of salt and pepper. Stir well to mix. Work the pizza dough into whichever shape you desire. Spread the ricotta cheese on top, and then top with the zucchini mixture. Add some pepper flakes if you like spice in your life. Reduce oven temperature to 450º and bake pizza for about 12 minutes, or until the crust begins to turn golden and the cheese has started to bubble.